Okay, let's have another one, probably much easier than the last couple have been. Anyone recognise this very distinctive insect from Japan? The leader board currently has Adam Yates in front with five points, followed by tf with three, intercostal with two and Reprobus with one. Remember, oneupmanship is not only permitted, it is encouraged. You know I know this one already! Don't know if in fairness I should be considered eligible, so I'll give you "code". It's E********** s********, one of the only 2 odonates that is neither dragonfly nor damselfly. Honestly, before looking at the comments I thought that's odd, it looks like a dragonfly (with large hemispherical eyes that dont protrude like a damselfly's but its wings are folded over its back. Sure enough the commenters recognised it as an Odonate that is neither Anisoptera or Zygoptera. Cool, I didn't no they existed before this morning. So to go for the steal. It is as Vazrick wrote Epiophlebia superstes. E. superstes is one of two members of Epiophlebioptera a basal suborder of Odonata that is the sister taxon of the more familiar Anisoptera (Dragonflies). 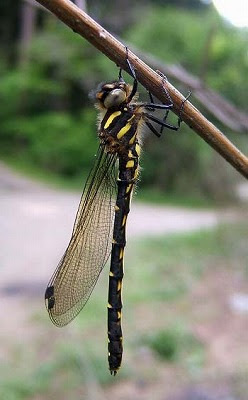 A derived character shared with dragonflies include the gills of the naiads located inside the rectal chamber however they retain damselfly-like wings. Despite being an ancient basal brach they have no fossil record, so I guess they've been living up in their high altitude fast flowing streams where the preservation potential is almost nil for a long time. Drat - I finally get one and then I mistakenly delete the comment. And I had a hilarious crack about baraminologists and cladists. I should probably earn negative points for that. If it got between a dragonfly and a damselfly it must be a knightfly, right? Sorry about the slow response; I put this one up then had trouble finding time to post the follow-up. So: three points for Adam, two points for the Watcher (which would have gone to Neil, but I don't think I can give points for an answer only he and I saw), one point for Vazrick. Oh, and as Adam has now built himself an overall lead, it's probably worth mentioning that whoever wins a Name the Bug championship by getting ten points or more will be ineligible for the next two championships afterwards (just so we get a range of people winning). They'll still be welcome to comment on Name the Bug posts and supply IDs, of course; they just won't be eligible to receive points until after two more people have won rounds.